According to recent Gallup research, the millennial generation can be described as unattached, connected, unconstrained and idealistic. 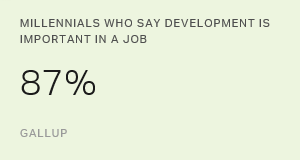 The last characteristic, idealistic, reflects millennials' relatively high levels of optimism. Millennials, who are currently between the ages of 19 and 36, view the economy and their own financial situations more positively than do those in other generations. Millennials' idealistic nature also extends to how they view the businesses with which they interact. Gallup found that an impressive 80% of them say they have "some" or "a lot" of trust in the companies they do business with to keep their personal information secure. This overall number aligns with those of older generations. However, across every business type and industry that Gallup has studied, millennials are the generation that is most trusting of institutions to safeguard their personal data. 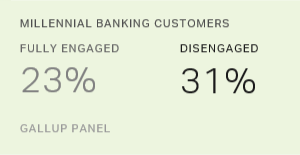 Millennials exhibit the greatest amount of trust in their primary bank, with 67% of this group saying they have a lot of trust in this institution, compared with 56% of non-millennials. % "A Lot of Trust"
All four generations -- millennials, Gen Xers, baby boomers and traditionalists -- share a lack of trust in certain institutions. Every generation trusts online retailers and social networking websites or applications the least with the security of their data, with only 4% of millennials reporting they have a lot of trust in the latter. Millennials may see these types of businesses as more susceptible to data breaches, or they might not believe they hold the security of customers' data in high regard in the first place. In any case, this is a miss on the part of online businesses, as this lack of trust likely deters millennials from fully interacting with them. Millennials conduct their business in an age where personal information is currency. Often, the "price of entry" to participate is permission to track, analyze and market to consumers. While the majority of millennials generally feel good about the security of their data, they feel differently about the privacy of their data. Less than half of millennials (44%) believe their personal information is kept private by the businesses or companies they interact with "all" or "most" of the time. Expectations of personal privacy in the digital era primarily appear to be related to age. Of all generations, millennials are the group most likely to say their data are being kept private -- and by a considerable margin. Twenty-nine percent of traditionalists and 32% of Gen Xers and baby boomers feel the same about the privacy of their personal information. Traditionalists are more likely to say their personal information is kept private "little" or "none" of the time. Trust "All"/"Most of the time"
Trust "Little"/"None of the time"
Do Millennials Not Know the Risks, or Do They Not Care? One school of thought about millennials and privacy notes that the generation is a highly connected group that has never known a world without smartphones, apps, the internet or computers, and the inherent risks to privacy that this technology poses. As such, the theory is they have lower expectations about the security of their personal information than do other generations. Because everything is available online these days, and even information that is not easily accessible is increasingly vulnerable to hackers, this generation should expect less. Millennials have never really known a world without technology and data, and they might see data breaches and misuse as unfortunate, but normal. But another perspective argues just the opposite. To its adherents, millennials should have higher expectations for the security of their personal information than do other generations because they understand how technology works. They are fully aware of the inherent risks but believe technology will keep their personal information safe. Whatever the case, millennials have been exposed to a significant number of high-visibility data breaches. Knowledge of these breaches alone might make people question the privacy and security of their personal information online. But millennials seem to rise above this, remaining trusting -- and perhaps even idealistic -- in the face of an abundance of evidence that their online data might not be very secure. Download Gallup's report, How Millennials Want to Work and Live, to learn more about the millennial mindset and how it affects the economy, brands and the workplace.